Shelley Fairbairn, Ph.D., is a professor at the Drake University School of Education and a national teacher professional development consultant. 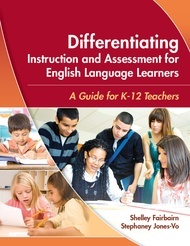 Fairbairn specializes in the instruction, assessment, and grading of K–12 English language learners; issues of cultural and linguistic diversity; and teacher education. Stephaney Jones-Vo, M.A., is a consultant and professional developer focusing on linguistic differentiation, literacy, and equity. She has extensive experience as a K–12 ESOL teacher, Title III grants director, refugee sponsor and resettlement volunteer, and teacher of adult refugees. As a private consultant for Starfish Education, her passion continues to be English learners, from early childhood age to adult.